Thousands of years ago, a girl in Israel was twelve years old when she got sick and died. She was a real girl. We don’t know much about her, so I will make up her story. We will call her Sarah and this is what I think may have happened. Sarah an only child, lived in a village where her papa was a well-known ruler or teacher at the town’s synagogue. A synagogue is a place of worship for the Jewish people. Her mama’s name was Naomi and Jairus was her papa. They were a busy family, with many responsibilities in the town and synagogue as well as caring for others. Naomi made food for anyone who was sick or in need. Sarah helped prepare the meals and accompanied her when she delivered them. On the way, they were stopped by others and they chatted. This was the best way for Sarah’s family to find out the news and see who needed help. Everyone loved them and liked to visit. A few days later, Sarah started coughing and she had a fever. Naomi left her in bed with a servant in charge when she took some meals over to friends. When she arrived back home she immediately checked on Sarah. “My dear, you are quite warm. Let me get you some water.” Naomi gave Sarah sips of water and put a cool cloth on her forehead. Papa took her into his strong arms. He wasn’t able to get her to smile, nor could he take her fever away. Jairus wasted no time to go find the teacher. Jesus, the Teacher, was down by the sea surrounded by a mob of people. Most of the people came from other villages. Many people asked Him questions. Some were waiting to see a miracle. Others were his followers and tried to be near Him as often as possible. A few of His close disciples were also with Him. Jesus said He would go with him. The crowd followed. 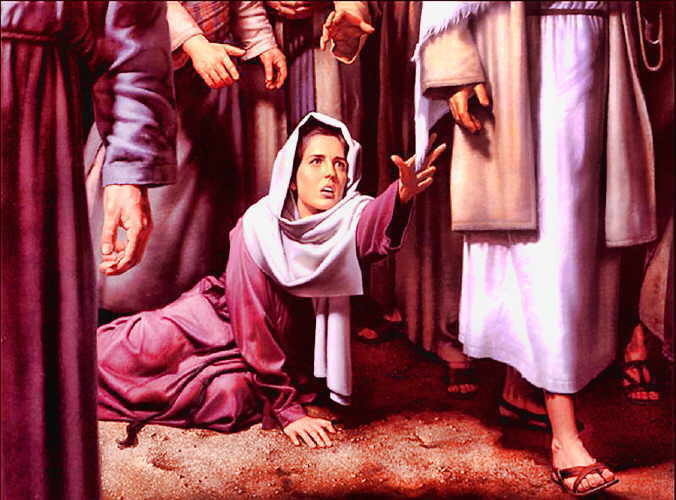 Before they could get to Jairus’ house, Jesus stopped because a woman touched his garment. At the time she touched Him, He healed her because of her faith. Immediately, Sarah jumped up and walked around the bed to her parents. They embraced. They were almost overcome with joy! The Lord Jesus had made her alive again! He told them to give her some food. Sarah never thought her mama’s cooking had ever tasted so good. The people who mourned returned and there was a celebration. Jesus told Jairus to believe. His faith brought Jesus to heal his daughter. He trusted and believed Jesus could do anything even bring his daughter back to life. Only Jesus, who is God, can bring people back to life again. He made her and gave her life again. Jesus healed many people while He walked on the earth. You can read this true account in Matthew 9:18-26 and Mark 5:21-43. Remember, part of what I wrote is my imagination—the center part about Jesus healing her is fact.